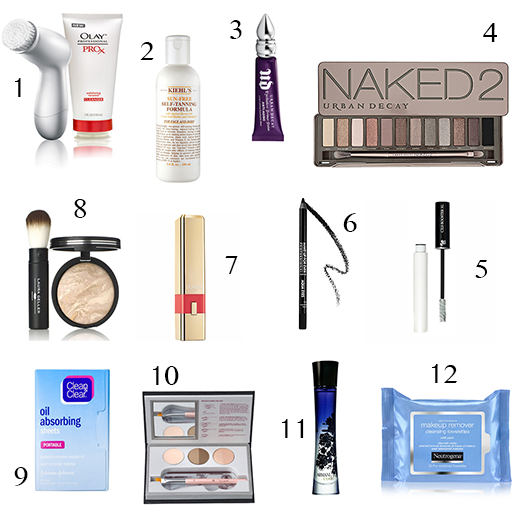 I love trying new beauty products, however there are some I swear by. I thought I'd share a few of my MUST HAVES! 1. Olay Pro-X Cleansing System - At $100+ the Clarisonic was out of my budget, but for only $29.99 the Pro-X gentle exfoliates my skin leaving it soft and smooth. 2. Kiehl's Sun Free Self Tanning - This cream goes on easy, feels smooth, and looks amazing. It doesn't streak either which I find sometimes happens with other creams. I exfoliate before using and it lasts up to 2-3 days, then I have to reapply. If you want a darker color you should apply every night. 3. Urban Decay Eyeshadow Primer Anti Aging - It moisturizes, goes on smooth, and keeps my eyeshadow from falling into the dreaded crease. Plus it's proactively stopping any wrinkles...right?! 4. Naked 2 Urban Decay - I'm obsessed with this palette. You can't go wrong, all the colors blend together effortlessly. My favorites are Snakebite, Tease, and Half Baked. 5. Lancome CILS Booster - This was highly recommended to me and has changed my lashes forever. The booster makes my lashes look fuller and longer and the best part, it works great with any mascara. 6. Make Up For Ever Aqua Eyes - Glides on smooth and like the name states, it truly lasts forever. Through all my tears over the past few months, this eyeliner stayed by my side and never left my lids. At the end of the night though, it does comes off easily with makeup remover. 7. L'Oreal Colour Caresse by Colour Riche - I don't go anywhere without my lip balm, but I rarely wear lipstick. I had a coupon and decided to try this product out. The Sunset Angora shade is very lightweight and only adds a hint of color, which I love. 8. Laura Geller Balance N Brighten - Hands down the best full coverage face powder. It's easy to apply and lasts long. 9. Clean & Clear Oil Absorbing Sheets - I have very oily skin so these absorbing sheets are a must. 10. Anastasia Beverly Hills Brows and Eyes - I have the blonde kit which comes with brow wax cream, an eye shadow duo, and 2 amazing brow powders that I combine to get my desired look. 11. Armoni Code - I've been wearing this fragrance for years and love it. It lasts all day and isn't overpowering like some perfumes I've tried. 12. Neutrogena Makeup Remover Cleansing Towelettes - At the end of the day when I'm tried and lazy, these wipes are the answer and just one gets the job done.